It’s Super Bowl week! To me, the best part of the Super Bowl is the pre-game show, the commercials, the half-time show, the food and the premiere of The Voice afterwards. Whether you are hosting friends, going someplace or staying at home with your family, this week’s recipes are dedicated to making it a tasty few hours. I was introduced to this recipe by Linda who got it from Amber so you can see that it’s one worth passing along. David eats it with a fork (that’s because he’s healthier than the rest of us) but the kids like to try it with the various chips. Sometimes they even remember to put the dip on the chip. 2 cans of black beans, drained. Drain and rinse black beans and corn. Put in a bowl. Add the feta and cilantro. Mix the dressing (ingredients #5-7) in a separate container and then pour over the bean and corn mixture. Gently stir. 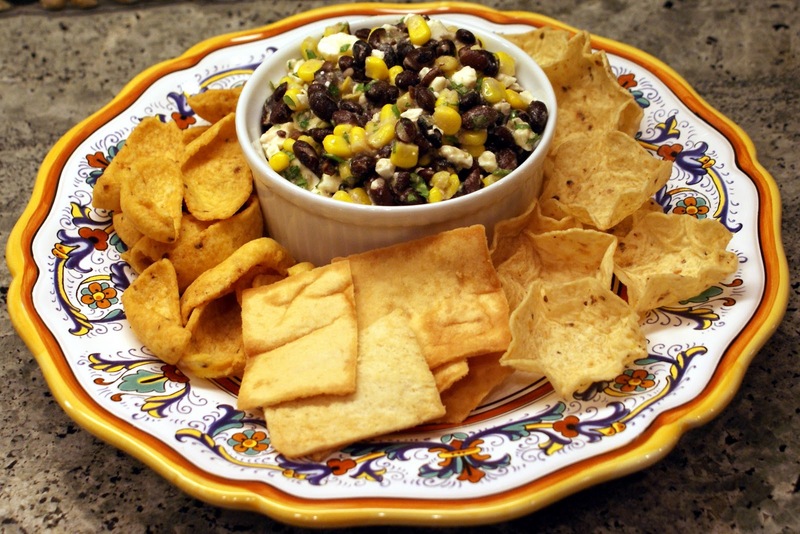 Serve with Fritos Scoops, Tostitos Scoops or pita chips. This is an oldie but a goodie from The Silver Palate Cookbook. If you haven’t made it recently, dust off the cookbook and make it again. I was first introduced to it when our younger kids were born. The great parents in our older son’s pre-school class took turns bringing meals (thank you – that is the best gift ever!) and one mom brought Chicken Marbella. I was so enamored that I asked for the recipe. As I raved about it to fellow moms, I quickly learned that many others had discovered this dish before me. The best part is that you marinate the chicken the night before and then simply bake it the following night. The quantity can scale down for your family or up for a crowd. It’s good hot, room temp or cold. The recipe below is slightly adjusted from the original, i.e., I have scaled it down to feed our family, cut the amount of brown sugar in half, etc. Click here for the original recipe. In a bowl, combine ingredients #1-10. Place chicken in a Ziploc bag and pour marinade over it. Zip and let marinate, refrigerated, overnight. The Ziploc bags make it easy to flip and shake and lay flat in the refrigerator. Arrange chicken in a single layer in a shallow baking pan and pour marinade over it evenly. Sprinkle chicken pieces with brown sugar and pour white wine around them. Bake for 50 minutes to 1 hour, basting regularly. The chicken is done when the thickest portion of the chicken reaches 170 degrees. Serve it with a side of rice (I like Near East rice pilaf with toasted almonds) and a vegetable. Tasty! 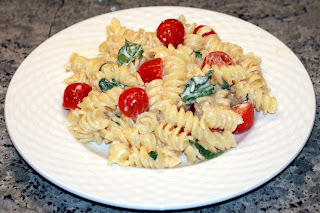 It looks like pasta week at our house – how did that happen? Maybe subconsciously I am thinking that it is winter and semi-chilly in Dallas, so we are stuffing ourselves with carbs in preparation for hibernation in case it actually turns cold here. Barefoot Contessa has a great Lemon Fusilli with Arugula in her At Home cookbook. Heat the olive oil in a medium saucepan over medium heat, add the garlic, and cook for 60 seconds. Add the cream, 6 T lemon juice, 2 teaspoons of salt, and 1 teaspoon of pepper. Bring to a boil, then lower the heat and simmer for 15 to 20 minutes, until it starts to thicken. Bring a large pot of water to a boil and cook the pasta according to the directions on the package, stirring occasionally. Drain the pasta in a colander and place it back into the pot. Immediately add the cream mixture and cook it over medium-low heat for 3 minutes, until most of the sauce has been absorbed in the pasta. Pour the hot pasta into a large bowl, add the arugula, Parmesan, and tomatoes. Toss well and season to taste. This dish makes a great side for a roasted or grilled chicken. The results are in and have been tabulated and verified by the independent accounting firm of MannWaterhouseCoopersMann. Personally, I feel relieved that I am not alone in being lazy (I mean - enjoying the convenience) and using a box pancake mix. I will also attest that making them from scratch was not complex (I made both recipes in the same night) and delicious. Toe-may-toe, toe-mah-toe - I'm gonna eat me some pancakes morning noon and night. I have a meeting tonight and need to prepare dinner before I leave. My friend, Amber, created this dish - yes, that’s from scratch – a few words that have never been used to describe me and my cooking. 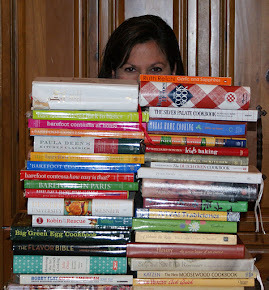 And another thing, Amber has a library of cookbooks that would dwarf my stack. It's like heaven over there. 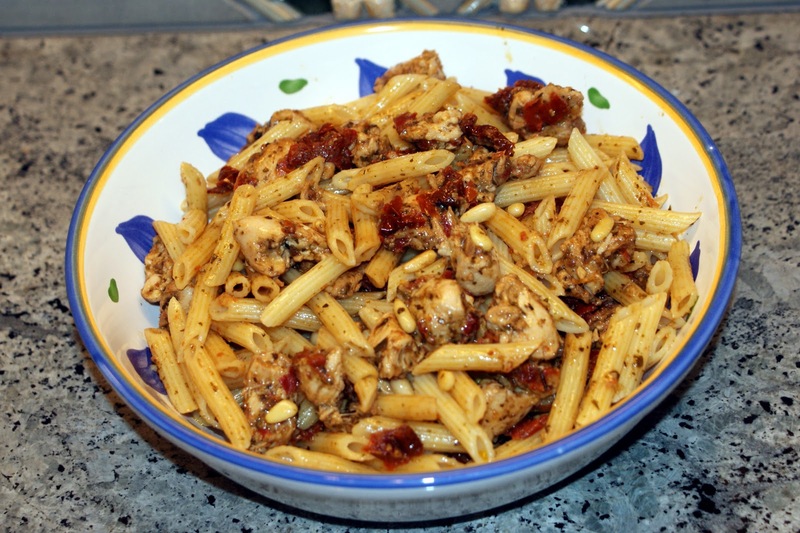 I enjoy the flavors of this dish – the sweetness of the sun-dried tomatoes, the nuttiness and crunch of the pine nuts and the comfort of the pasta and chicken. 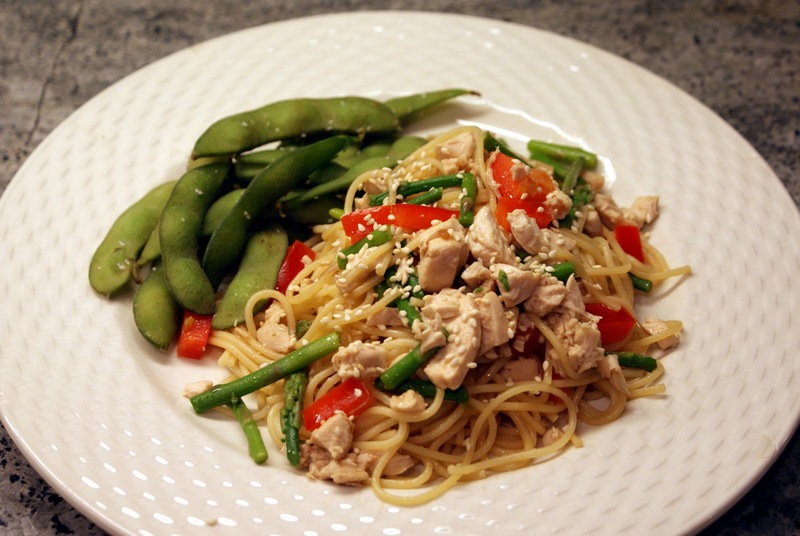 This dish is easy to make at home or if you’re traveling and have access to a kitchen. These proportions easily serve our family with plenty of leftovers. Drain the sundried tomatoes. Reserve 2 T of the oil in which to cook the chicken. Saute the chicken breasts in the sundried tomatoes with 2 T oil. When the chicken is cooked through, stir in the pesto (I tend to only use about half of the jar). Pour this mixture onto the cooked pasta (I like the mini-penne) and add pine nuts (toast them first in a dry saute pan or in the oven) and parmesan. Stir to mix. It’s the end of the weekend. Family has been in town (so fun!!) We went to the Fort Worth Rodeo this afternoon (so fun2!!) I’m worn out (in a really good, happy way) but everyone is still looking to me for dinner and I prefer to avoid the “I don’t like this dinner” refrain. Out comes a fan favorite – spaghetti and meatballs. These meatballs are easy and quick to make. Mix, roll and bake then submerge in your favorite sauce to absorb the flavor and voila! Dinner is served. Below are 2 versions, thanks to Susan B. again, for sharing hers. Preheat oven to 375. Mix ingredients #1-5. Line pan with aluminum foil and spray with cooking spray. 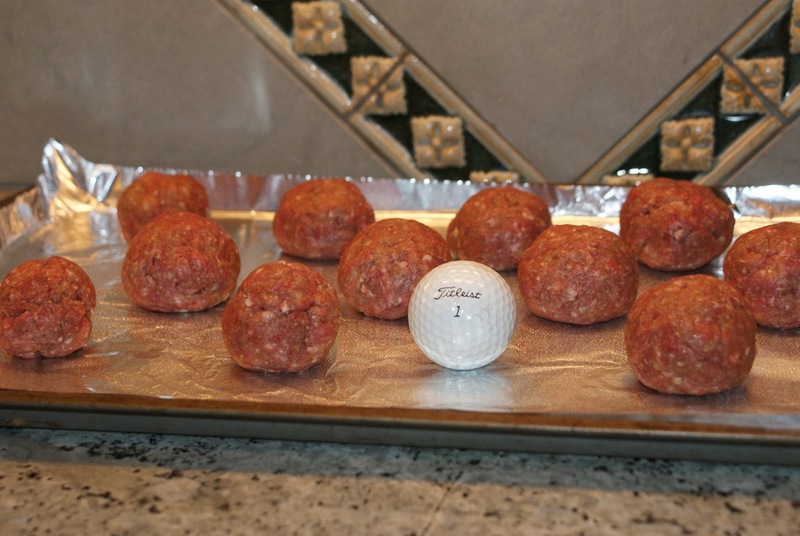 Roll the meatballs about the size of golf ball (hey, even David could do this part!) Bake for 30-35 minutes. Preheat oven to 425. Combine all ingredients, roll into meatballs and bake for 10 min. Turn and bake for an additional 10 minutes (total cooking time: 20 minutes). Place in your favorite spaghetti sauce (we happen to like Classico Four Cheese) and simmer. The longer you simmer, the more flavor the meatballs will absorb. Serve over spaghetti and with a slice of crusty bread and something green (meaning a vegetable - if your bread has something green growing on it, throw it away). 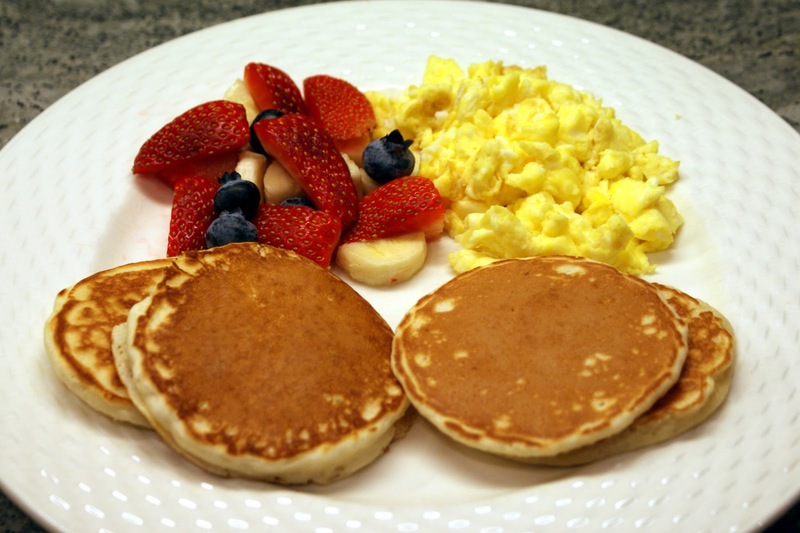 There is no doubt that my oldest kid’s favorite day at the cafeteria is “breakfast for lunch.” Linda W. serves pancakes for dinner too. Her theory is that the eggs and milk in the batter make it healthy. Sounds logical to me! Susan B. (see sea bass recipe) also shared her pancake recipe. Her kids prefer this recipe so much that she takes it with them on trips (I can imagine her packing list: toothbrush, underwear, pancake recipe…)! Break out of the box – try one of these recipes this weekend. Cook on griddle heated to 350 degrees. Cook until bubbles begin to pop, then flip and cook another 2-3min. My friend has gone vegan so now I’m intrigued with this way of eating and searching for recipes that she might use (French fries are on the list – how bad can this be?). Did you know that honey is not considered vegan? (or at least there is a debate, but strict vegans say that since it is made by bees, then it is not true to the definition of vegan which is “someone who chooses to avoid using or consuming animal products.”) The granola recipe on the blog would not qualify unless you use the karo, molasses or maple instead of the honey. The Trail Mix would qualify, in case you were considering becoming vegan too. Tapenade is a good appetizer and not one that you see everyday. It’s easy to make in your food processor and you can pair it with a variety of different foods: serve it with French bread slices toasted with olive oil, in seeded cherry tomato halves (try using a small melon baller, a grapefruit spoon or a small paring knife), on endive leaves or cucumber slices, as a dip for your favorite vegetables or as a spread on a sandwich. Place ingredients #1-6 in food processor and pulse. Gradually add in olive oil and continue to pulse until the mixture forms a coarse paste. 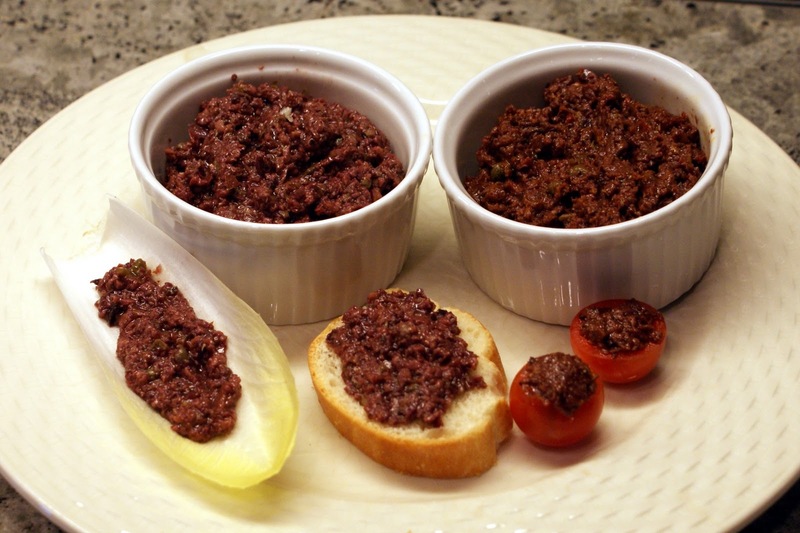 For a little different twist (fyi, 4 out of 5 surveyed preferred this variation), add some sun-dried tomatoes to the tapenade. Follow the directions above (ingredients 1-6 + 8), pulse, then add 1 T of the oil from sundried tomatoes and pulse some more. The tomatoes give it a sweeter flavor and mute the acidic kick of the olives. Have you come off of your sugar high yet? After eating that sheath cake all weekend, the gym is calling my name. Most days I just don’t answer. I know that a whole roast chicken is available at every store around: Central Market (David’s favorite), Whole Foods ($1 off on Wednesdays), eatZi’s, Boston Market, Kuby’s (smoked chicken)… yes, it is super convenient to pick this up and I often do. However, if I am in the mood to have home cooked and have an hour to bake, it really is pretty easy. The recipes that I have found and tried are basically the same with a few variations of flavoring: Joy of Cooking – butter and salt; Ruth Reichl, Garlic and Sapphires (book club - loved it!) - olive oil, lemon, salt and pepper; Ina Garten (Barefoot Contessa) - butter, salt and pepper, lemon, herbs. Side story – in Ina’s recipe, it provides directions to “Remove any ... leftover pin feathers....” Has anyone ever bought a chicken that still has pin feathers? Really – where? She puts the true meaning into “farm fresh.” (Since the original post, some helpful readers have enlightened me: kosher chickens tend to have pin feathers. Thanks for making me wiser!). Preheat the oven to 400 (Ina cooks at 425). Rinse and pat dry the chicken. Grease (with oil, butter or Pam) your shallow roasting pan or baking sheet. Brush or rub the chicken with butter (2-3 T) or olive oil. Liberally sprinkle the skin and the cavity with salt and pepper. Bake for 55-65 minutes (for 4 lb chicken – if you have a larger chicken, cook 8 minutes more for each additional lb) until the thickest part of the breast reaches 170-175 degrees (using your handy dandy meat thermometer!). If you want to cook some vegetables with the chicken, then consider adding these around the chicken in the pan: yellow or white onion, sliced or cut into chunk pieces; carrots, peeled and cut into 2 inch chunks; fennel, tops removed and cut into wedges; Yukon gold potatoes, peeled and cut into 8 pieces; 3-4 garlic cloves. Prior to placing in the dish, toss the veggies with olive oil until lightly coated then spread in the pan around the chicken – you can also sprinkle some salt and pepper on them too. Some recipes suggest placing a lemon in the cavity by either puncturing it first or cutting the lemon in half. You can also place thyme sprigs and/or garlic cloves in there too. It depends on the flavors that you like. As you can see from the picture, we had a bake off. The butter (chicken on the left) made a browner skin. The oil (chicken on the right) made a bigger mess of my oven. David claimed that he couldn't taste the difference. There you have it - very scientific and definitive. I warned you that this day was coming. If it’s too much, then look away. As I was making the icing, David looked in the saucepan and said “I didn’t know there was a stick of butter in there.” I lied and told him that it wasn't real. Good thing he didn’t see the other 2 sticks that are part of the cake batter! 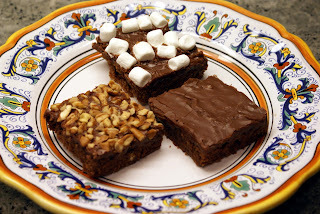 I am not above making cake or brownies from a box but this recipe – again from my mom – is worth the extra measuring. There are 3 ways to top it – traditional (with pecans); allergy-free (no pecans); and the 8 and under set (with marshmallows). It actually tastes better the day after you make it – my problem is that I can’t wait that long. Sift together the flour and sugar (ingredients 1-2). Place 2 sticks of butter, 4 T of cocoa and 1 c water in a saucepan and bring to a boil. Pour this mixture over the sugar/flour mix. Stir well. To this cake mixture, add ingredients 6-8 and 1 t vanilla. Mix well and pour into a jelly roll pan. Bake for 20 minutes in a 400 degree oven. 5 minutes prior to the cake coming out of the oven (this is a timing thing), bring to a boil 1 stick of butter, 4 T cocoa and 6 T milk. Remove from heat and pour into a large mixing bowl containing items 4 c powdered sugar, mix. Add 1 t vanilla (and item #12, if you choose). Pour onto cake immediately after the cake is removed from the oven. The warmth of the cake and the liquidity of the frosting will allow you to easily spread it evenly and smoothly across the cake. If you top with marshmallows, press them gently into the icing so they adhere. Try to let the cake cool before taking a bite – it will be challenging - and pour yourself a tall glass of milk. 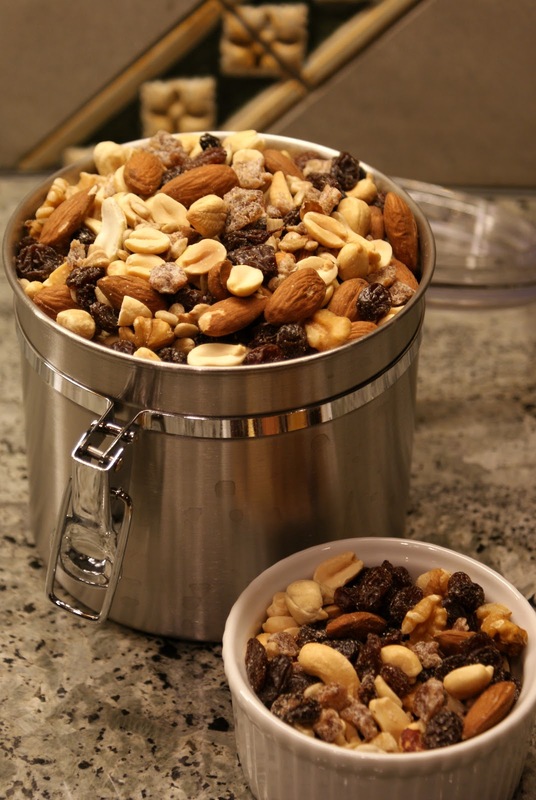 This trail mix is served in the pro shop where the kids have tennis lessons. 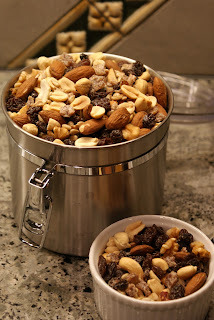 The staff says that they get it from Costco but since (a) I don’t have a membership at Costco and (b) I probably couldn’t eat a Costco size bag of trail mix, I reverse engineered it (my techie friends will understand that one) and this tastes pretty close. You can make this to any quantity you want (meaning: if you want to try it first before committing, cut all quantities in half or quarter and see what you think). Just measure and mix. If you sprinkle in some M&Ms, you might actually get your kids to eat it too. 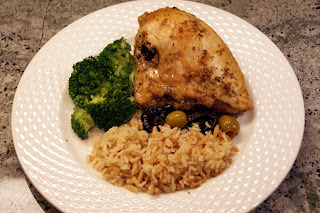 How many ways can I cook chicken and still get the kids to eat it? Mixing it with pasta is always a good bet (another is wrapping it in a tortilla or serving it with a sauce like ketchup or BBQ – what is your secret?). This is really a combination of a few, different recipes so try them both and have your own taste test. Preheat oven to 350. 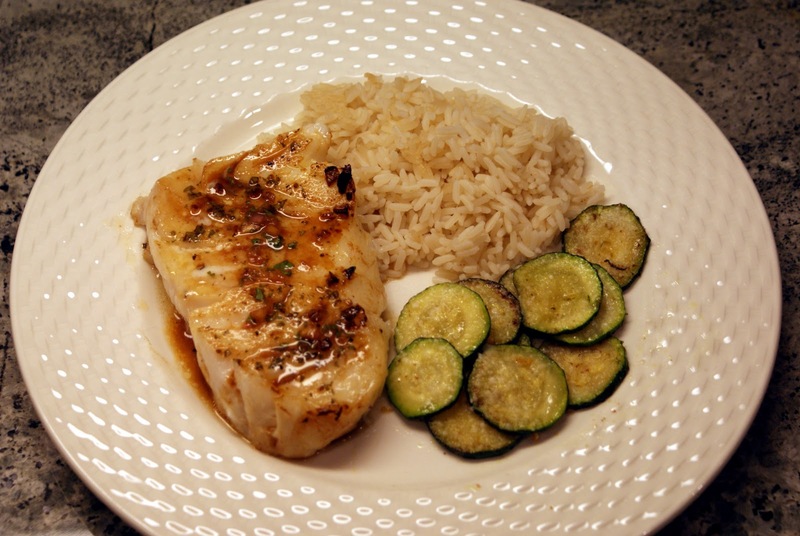 Rub chicken breasts with olive oil and sprinkle with salt and pepper. Roast for 35-45 minutes (chicken should reach 170 degrees). Allow to cool. Once cooled, remove skin and pull meat from the bones. Cut into bite size pieces. To cook asparagus, either cut into bite size pieces (about 2 inches long) and sauté in 1 T vegetable oil or blanch (whole) in boiling water for 3-5 minutes. Remove from boiling water and drop into a bowl of ice water to stop the cooking. Drain and then cut into bite size pieces. Boil water and cook spaghetti per directions on the box (about 8 minutes). Drain. Whisk together all of the ingredients for either dressing #1 or #2. Combine pasta, asparagus, chicken and red bell pepper (optional) and then pour your selected dressing over the entire mixture. Mix. Top with toasted sesame seeds and scallions, if desired. Serve warm or at room temperature. A meat thermometer can quickly and easily tell you the temperature of your meat, chicken, lamb, turkey... No more guessing and I'm not good enough to determine "doneness" by "firmness." I like the Maverick Redi Fork Pro - it's electronic and has an easy guide on the panel for each type of meat's recommended temperatures. Whether you want to lose weight or simply educate yourself by tracking the food that you eat, the calories you consume or the activity that you do and the effect that these have on your weight, MyFitnessPal is a helpful and easy online tool. It's free too! My mom bought me this and at first, I thought it was kind of silly (sorry, mom). But this thing really works and I feel less guilty knowing that the fat is being left behind and just the juice is going back on the meat. I guess mom really does know best. 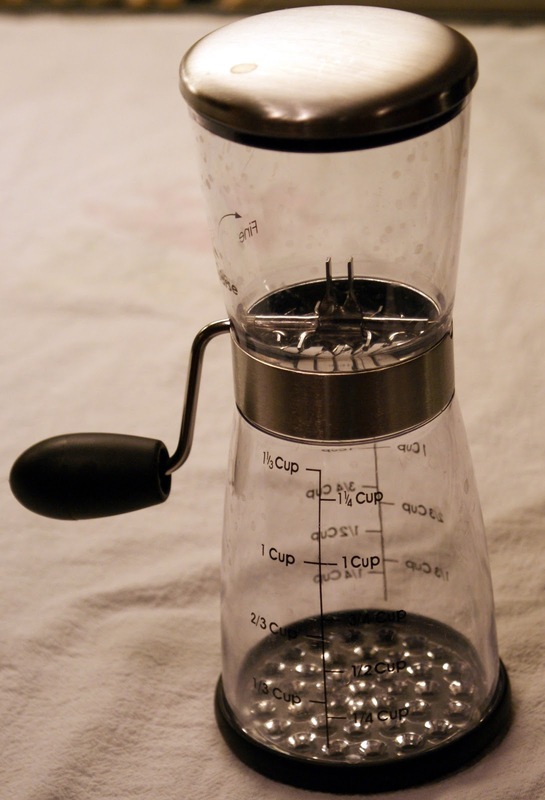 Oxo offers 2 cup and 4 cup options. For the times that you need chopped nuts and feel like doing them yourself (or ask the kids to do the work for you), use this handy tool. I have this one from Williams-Sonoma, search on “nut chopper.” Target and Bed Bath and Beyond carry one by Progressive International. Use a meat tenderizer to flatten chicken and tenderize meats. There are 2 sides - a flat side for pounding and a textured side for tenderizing. David is by far the healthiest eater in our family. Despite all the salads and turkey sandwiches, he wasn’t losing weight so he went to a nutritionist. After mumbling about “waste of my time” and “tell me something new”, he started to implement her strategy of portion control, decreasing the amount of salad dressing he used and becoming more aware of food’s sodium levels and started to see results. I, however, am not willing to give up my occasional Oreo cookie so my doctor suggested that I track my caloric intake with an online tool like MyFitnessPal. It was such an eye opener. The tool made me aware of just how much food I was consuming and educated me on how the calories can quickly add up (and how if I exercised, I had more calories to spare!) So I will treat myself to an Oreo here and there, but maybe not 6 at a time – the tool is counting! 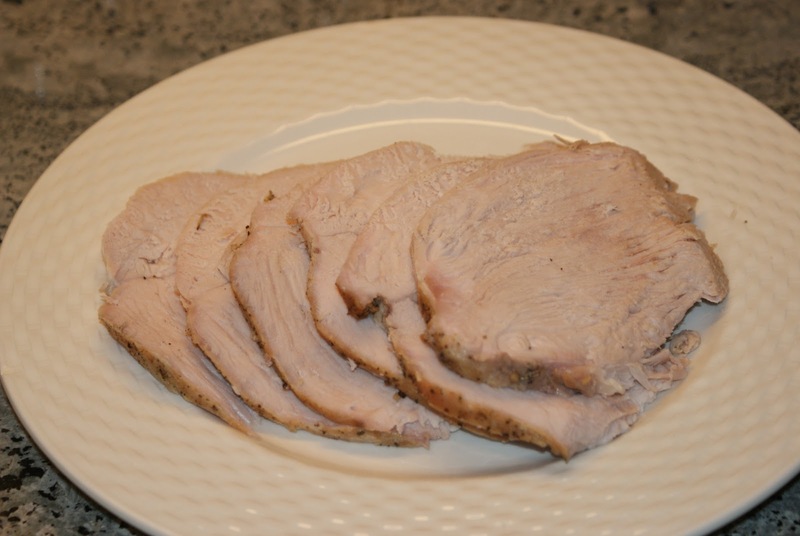 During David’s quest for healthier eating, we started cooking this turkey breast. With a half turkey breast (about 4-5 lbs), there is plenty for dinner and then for a few sandwiches during the week. Here is a link to Barefoot Contessa’s original recipe. Below is a modified version using ingredients that most of us probably already have in our pantry. Preheat the oven to 325. Place the turkey breast in a pan, skin side up. Combine items #2-10 to make a paste. Loosen the skin from the meat gently with your fingers. Pour half of the paste directly on the meat and the rest evenly on the skin. Pour the wine onto the bottom of the pan. Roast the turkey for 1 ½ to 2 hours, until the skin is golden brown. The time always varies for me (aka, it’s usually longer) and I definitely use my instant-read thermometer (like a Maverick Redi Fork Pro) to make sure the turkey reaches 165 degrees (test the thickest and meatiest parts of the breast). If the turkey is starting to get brown and crispy on top, place some aluminum foil loosely over the breast and keep cooking. When the turkey is done, cover with foil and allow it to rest at room temperature for 15 minutes. Slice and serve. 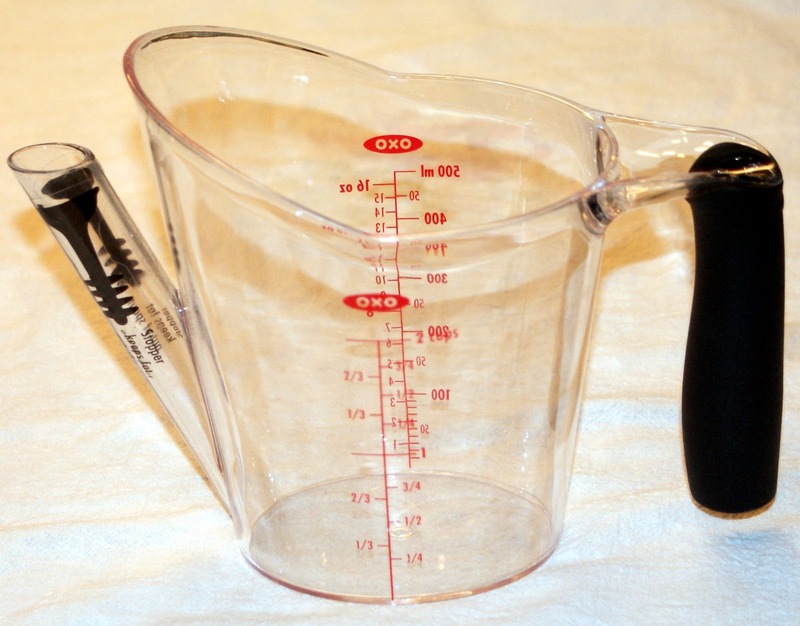 Pour the pan juices into a measuring cup with a fat separator (Oxo makes a 2 cup and 4 cup). 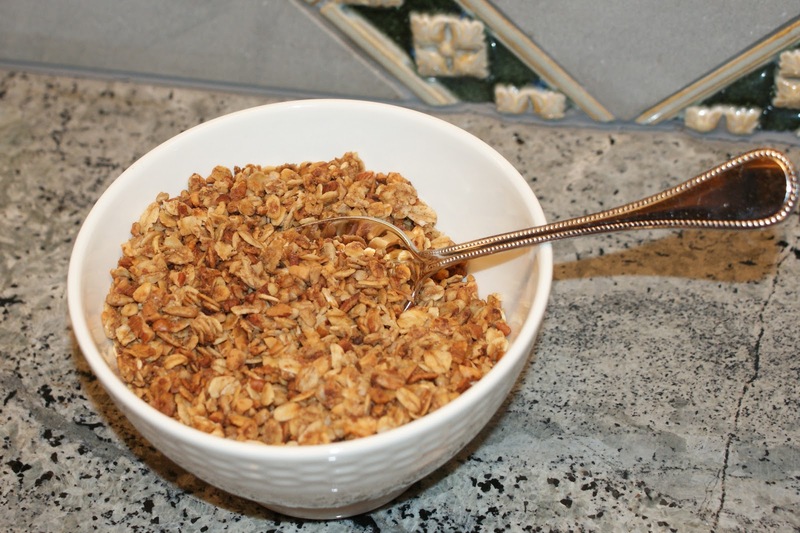 This will help you pour just the juice, not the fat, over the sliced turkey. Happy Birthday G, J and E!